The PowerBar is a big battery pack, let’s get that out of the way right off the bat. It’s pretty similar in size to a tallboy beer can, albeit with flat sides, so you aren’t going to be sticking this in your pocket. 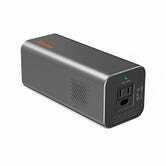 But in that package, you’ll find a 20,800mAh battery pack, two USB ports (one of which features Quick Charge 3.0), a USB-C port that doubles as the input, and yes, an 85W AC outlet that can charge a laptop, power a lamp, or even run a small TV for a time. It’s also never been less than it is today — $82 — so this is a great chance to stay on the grid even when you’re off the grid. Need even more power? 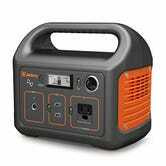 There’s also a full-on solar generator on sale.